This is the central thesis of Eight Men Out: Charles Comiskey's "ballplayers were the best and were paid as poorly as the worst,” as Eliot Asinof wrote. That couldn't be further from the truth. We can’t climb into the heads of the Black Sox to know exactly why they threw the World Series. But the players themselves rarely claimed, as Asinof did, that it was because of Comiskey’s low salaries or poor treatment — and we now have accurate salary information to back that up. Newly available organizational contract cards at the National Baseball Hall of Fame show that the White Sox's Opening Day payroll of $88,461 was more than $11,500 higher than that of the National League champion Reds, and several of the Black Sox players were among the highest-paid at their positions. If they did feel resentment at their salaries under the reserve-clause system, so did players from 15 other major-league teams. The scandal was much more complex than disgruntled players trying to get back at the big, bad boss. Arnold Rothstein, known as "The Big Bankroll," was credited as the mastermind of the plot by his henchman Abe Attell in a self-serving interview with Eliot Asinof years later, but it may have still gone through even without the involvement of the New York kingpin. Fixing the World Series was a total “team” effort and the White Sox players did most of the heavy lifting. Chick Gandil and Eddie Cicotte, separately and together, first approached Sport Sullivan, a prominent Boston bookmaker, and Sleepy Bill Burns, a former major-league pitcher, to get the fix rolling. Then they began recruiting their teammates in several meetings before the World Series. Rothstein eventually did get involved, but he was far from the only underworld figure to play a role. It’s easy to believe the Chicago White Sox players could be the targets of an Al Capone-style takeout by gamblers if they didn’t hold up their end of the fix. 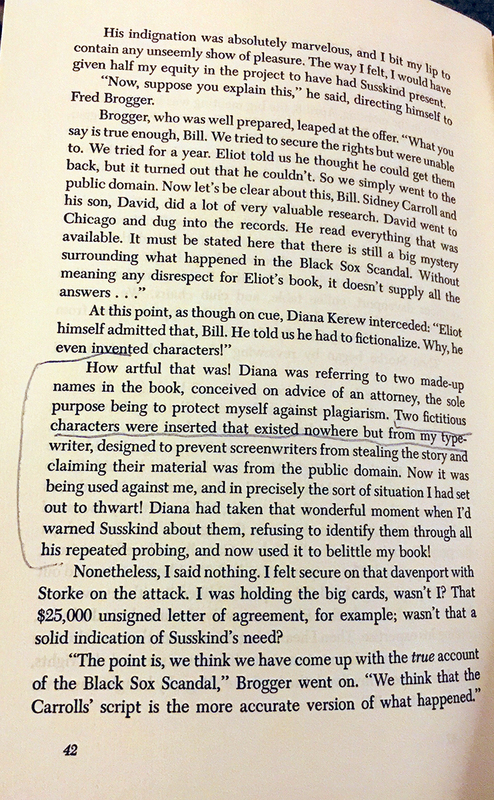 But Eliot Asinof said on multiple occasions, first in his Black Sox-related book Bleeding Between the Lines and then in subsequent interviews, that he invented the hitman character on the advice of his publisher to guard against copyright infringement. An attorney recommended that he do so in case anyone used the name “Harry F.” in future books and articles without citing his work; many writers have done just that. But there is little evidence to substantiate the claim that Williams's life was in danger. The primary source is an anecdote by a neighbor boy — first told four decades after the fact — who claimed Lefty's wife once told him the pitcher had been threatened. 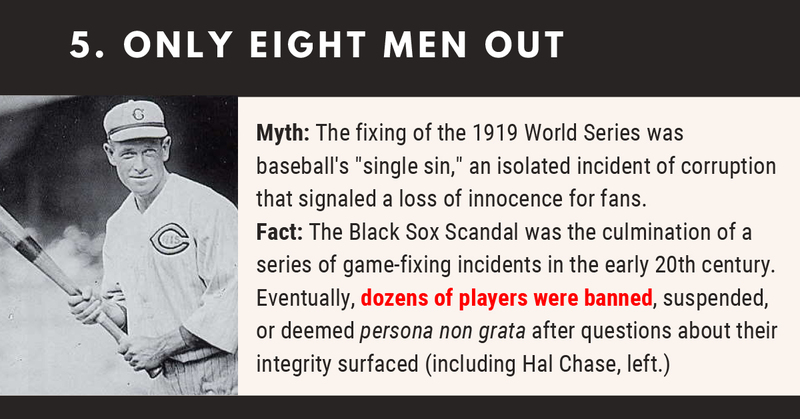 It’s impossible to understand the Black Sox Scandal without knowing how deeply the game was intertwined with America’s gambling-friendly culture at that time. Baseball’s powers-that-be mostly turned a blind eye to — and in some cases, implicitly encouraged — the corruption and game-fixing of the early twentieth century. Veteran first baseman Hal Chase was caught red-handed bribing teammates and opponents alike in 1918, but he was whitewashed by the National League. Future Hall of Famers Ty Cobb and Tris Speaker were accused of fixing a Tigers-Indians game just one week before the 1919 World Series. A major game-fixing scandal erupted in the Pacific Coast League in 1919, as well. As the historians Dr. Harold and Dorothy Seymour wrote, "The groundwork for the crooked 1919 World Series, like most striking events in history, was long prepared. The scandal was not an aberration brought about solely by a handful of villainous players. It was a culmination of corruption and attempts at corruption that reached back nearly twenty years." 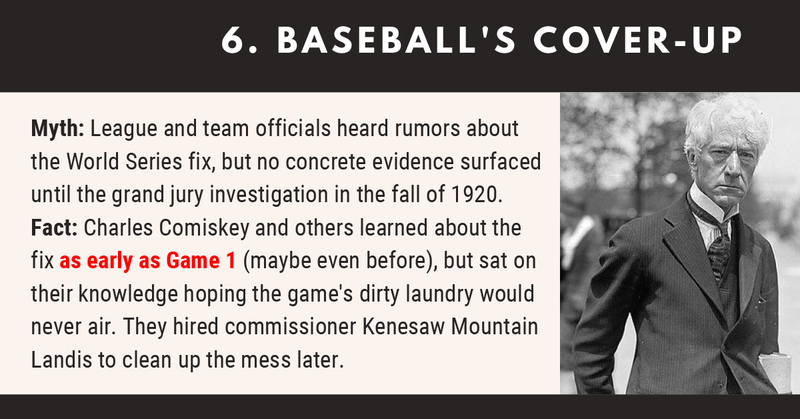 Who had "guilty knowledge" about the 1919 World Series fix? Just about everyone in the sport's inner circle, including White Sox owner Charles Comiskey, who admitted in a 1930 interview that he heard reports about the fix before any games were played. He sent manager Kid Gleason to interview a gambler immediately after the World Series and hired detectives to follow the suspected players during the offseason. But Comiskey and other baseball officials allowed most of the 1920 season to be played without publicizing what they had learned. A diligent investigation by reporters such as Hugh Fullerton, James Crusinberry, and a small Chicago-based gambling trade publication called Collyer’s Eye — the first to publicly name the players involved — helped expose the corruption and grease the wheels for a full legal inquiry. 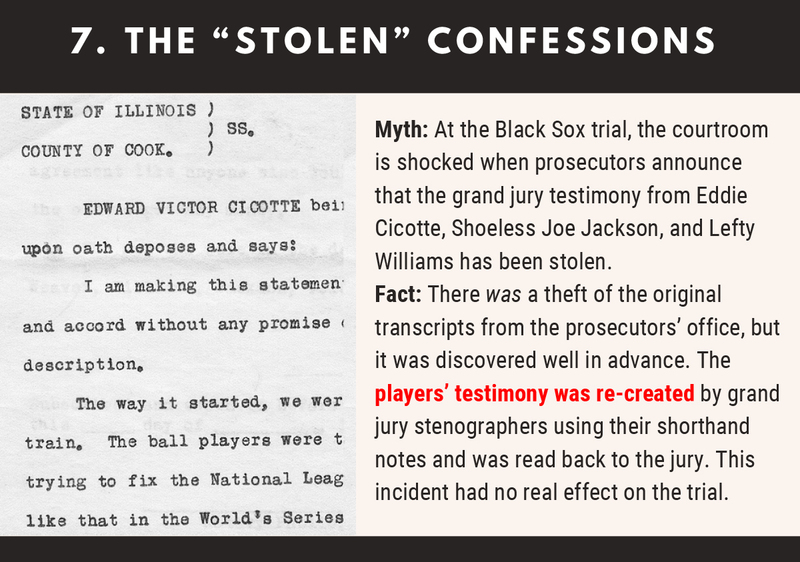 The Black Sox criminal trial, which resulted in the acquittal of the players, is often depicted as an example of Chicago-style corruption and shady courtroom shenanigans. 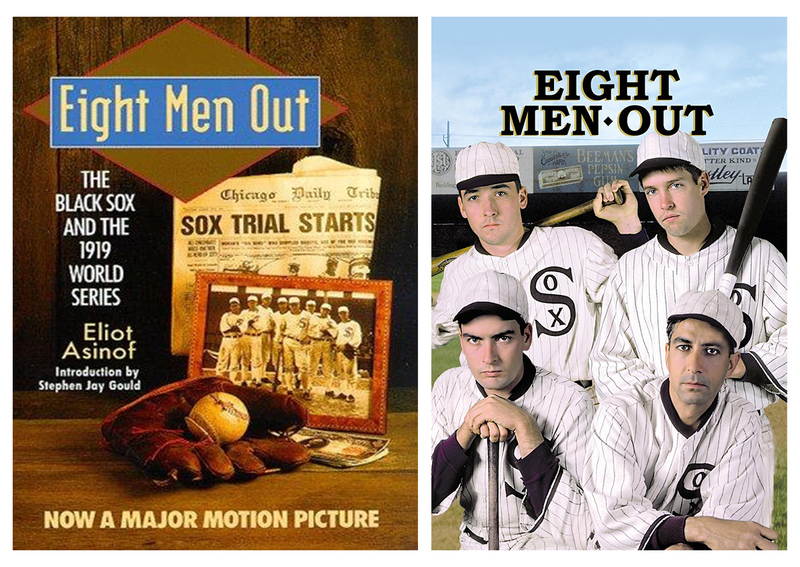 The theft of key files, including the players' grand jury testimony transcripts, from the Cook County State's Attorney's Office was dramatized in the film Eight Men Out, leading to baseless speculation on whether the White Sox lawyers had joined forces with gambler Arnold Rothstein to help out the players or if the trial's outcome had been "prearranged." But the theft was a minor incident that played no significant role in the jury's decision. When Eliot Asinof went looking for the surviving Black Sox in the early 1960s, he encountered resistance from almost every ballplayer he found; Happy Felsch was one of the few exceptions and one of his main sources for Eight Men Out. 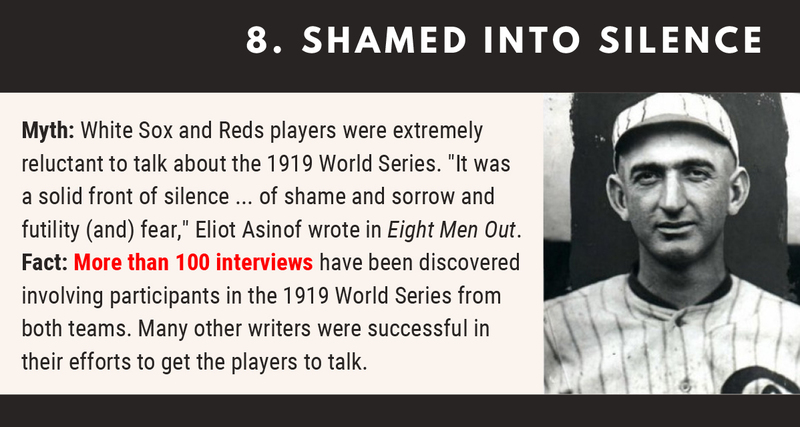 Asinof attributed their reluctance to talk to the stigma that everyone involved, even the innocent players, supposedly felt about the 1919 World Series. But that wasn’t the case at all. 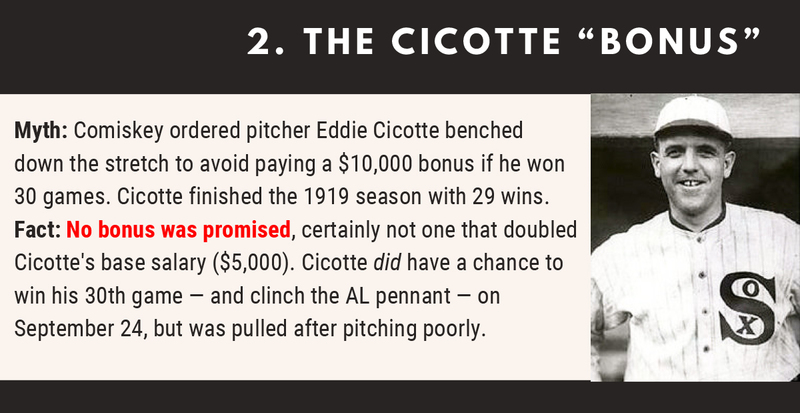 Some of the players expressed remorse (especially Eddie Cicotte and Felsch), while others remained defiant or claimed innocence. The players did not, as is commonly believed, hang their heads in shame and "drop out of sight" or "quietly vanish" after they were banned from baseball. 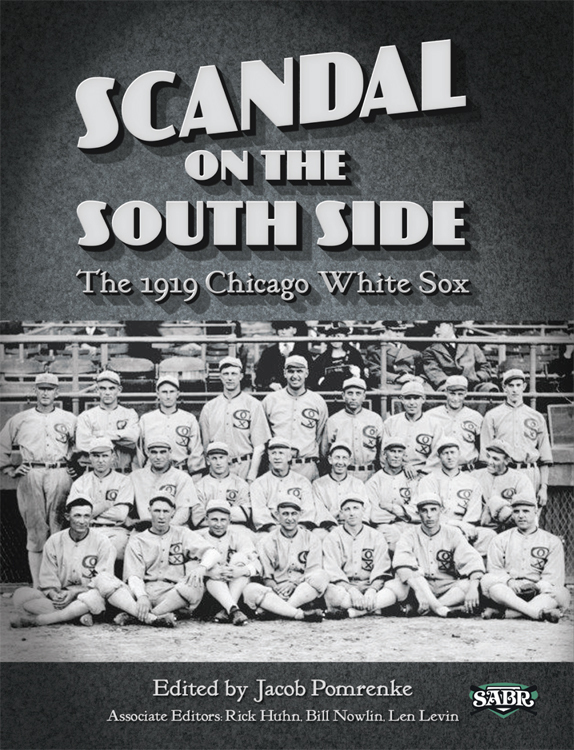 The Black Sox Scandal is a cold case, not a closed case. 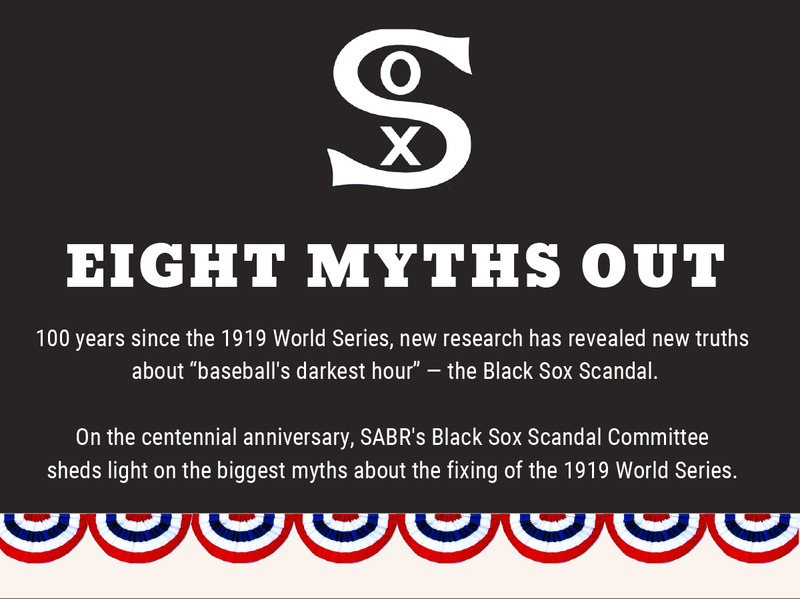 We hope this online guide, produced by members of SABR's Black Sox Scandal Research Committee, helps provide you with a more complete understanding of the 1919 World Series and inspires you to dig deeper and learn more. A lot of new information has been uncovered in recent years that has changed our collective knowledge of the Black Sox Scandal and its aftermath. All of these new pieces to the puzzle have provided definitive answers to some old mysteries and raised other questions in their place. It’s a story that continues to fascinate baseball fans, writers, and researchers all over the world. 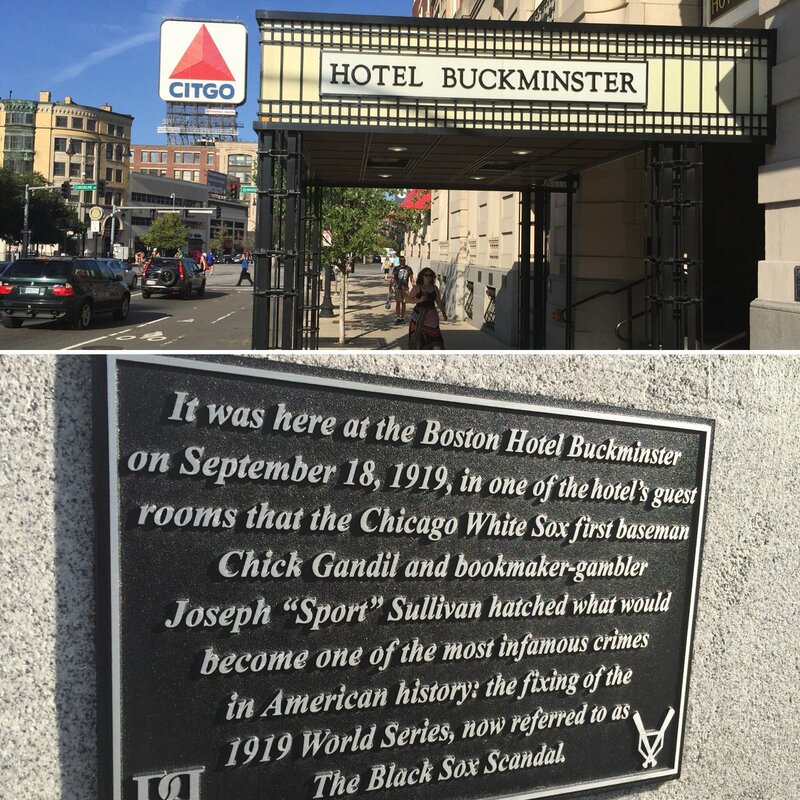 The Black Sox Scandal continues to be a relevant part of the sports world in the 21st century, especially as Major League Baseball begins to open its doors to legalized betting 100 years later. One hundred years after the 1919 World Series, we're still learning more every day about what happened on and off the field.